In November 2010 I bought a bargain of a skein of yarn at the Harrogate Knitting and Stitching Show. 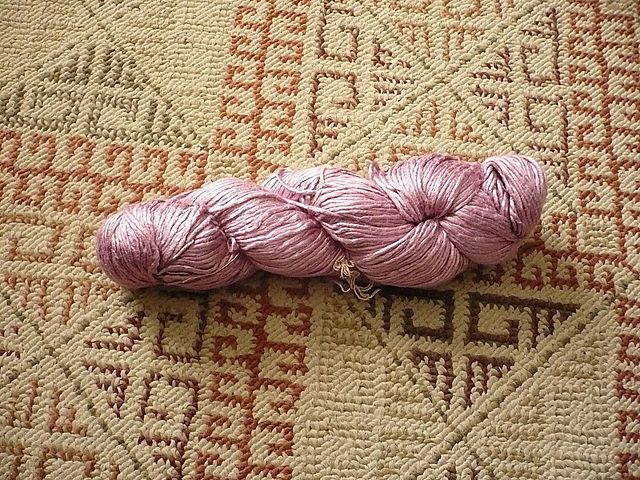 It was a delicious skein of 200m of DK weight silk singles yarn in an antique rose colour. It was from (the then new) Artisan Yarns. There doesn't seem to be any products on their ETSY shop and I don't know if that is a permanent situation but they do have stock in at Loop Knitting, so their yarn is still available somewhere. This particular skein has been burning a hole in my stash for a while. I love the yarn and the colour is so pretty, but when I had bright red hair it didn't suit me. I decided that I would offer the resulting item to my Mum as she loves this particular shade. After making that decision I found a pattern fairly quickly, Sierra Sunset Cowl by Kristen Ashbaugh-Helmreich. Over the last few years I have become a big fan of cowls. They stay where they are put, around your neck, and the ends don't dangle in your drink. 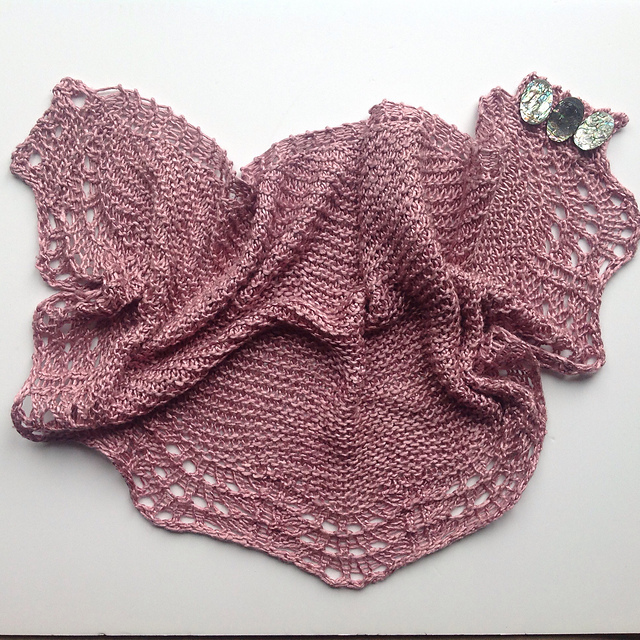 This pattern seemed a perfect use of this gorgeous yarn. 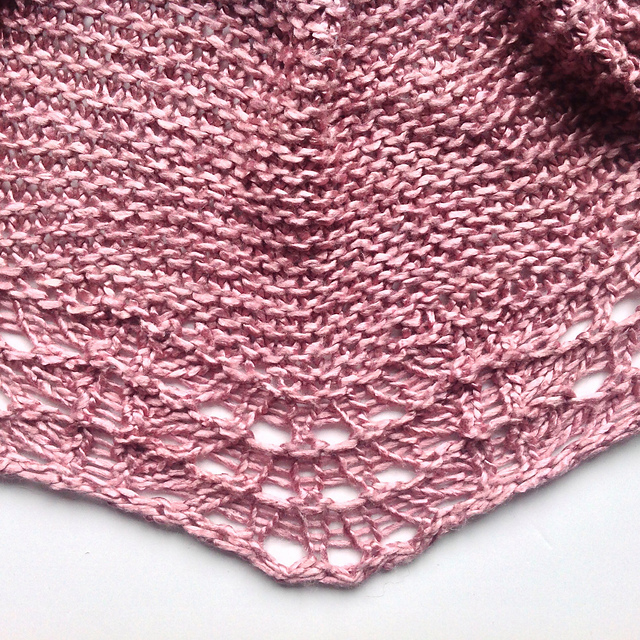 The pattern sample was knit in a wool/silk blend which meant that a drapey yarn would work well. This cowl is a clever construction. As the cowl sits reasonably snugly around the throat the designer has created a knit flat pattern that features a button fastening at the narrow part that sits at the back of the neck. This means if you don't want to pull the snug cowl over your head you can undo and refasten the buttons. I am fairly sure that I bought these buttons at either the same Harrogate Show or at another similar event. I got them from The Button Lady who has a stall at most big crafting events, in the UK, and there is always a crowd at her booth, because she sells such amazing buttons. These abalone shell buttons are very versatile, which is why I bought them for my button jar, as the iridescent qualities allow them to match several different colours. 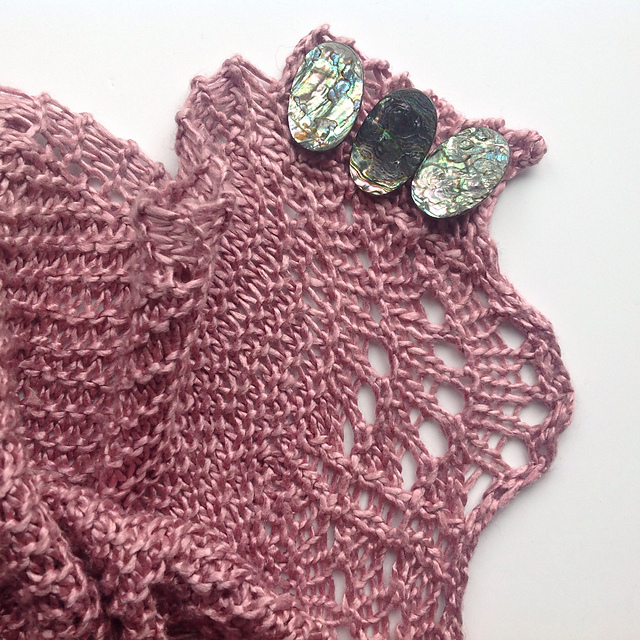 In this case the buttons pick up the pink from the shawl. The buttons could not have been chosen better as they fit the button holes perfectly. The buttons also help make the cowl almost like jewellery. 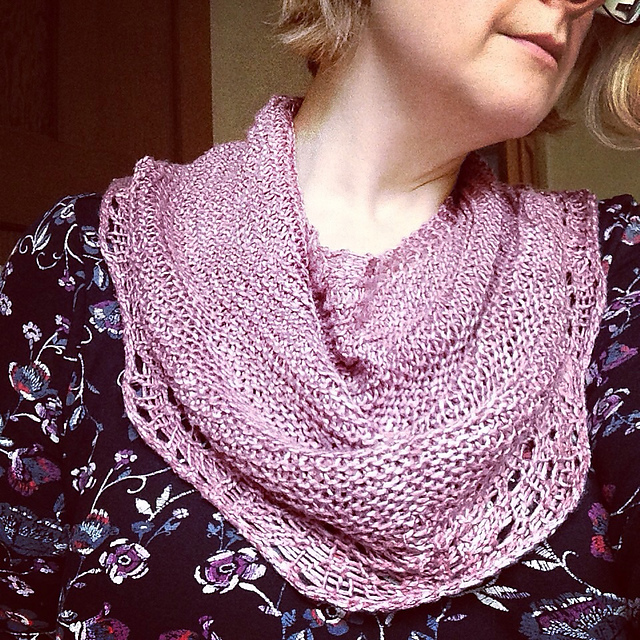 This simple project, involves a small amount of short row shaping and a very simple lace pattern, so it would be a good project for people wanting to practice those techniques. If you are a confident knitter, the project takes no time at all, I think I finished it in 2 days. The only downside to the pattern was the large quantities of pins I had to use to block it as the curved edges did not suit a wire blocking. Of course once I finished my project and tried it on for photography purposes, I realised that this colour now really suits me and I would love wearing it. However, I was a good daughter and handed it over to my Mum, because I had already offered it to her. So, if this project has taught me one thing, it is to never promise away a project until you know whether you are going to fall in love with it or not! I may have to knit another one, this time for me!